A semi permanent lip procedure can dramatically change the look of your mouth. Simply by tattooing the lip line, redefining the shape of your mouth your lips appear fuller and plumper. We will never work outside of the vermilion border (pink bits) because if we implant pigment around your mouth it will heal to a very different colour on and off your vermilion border. 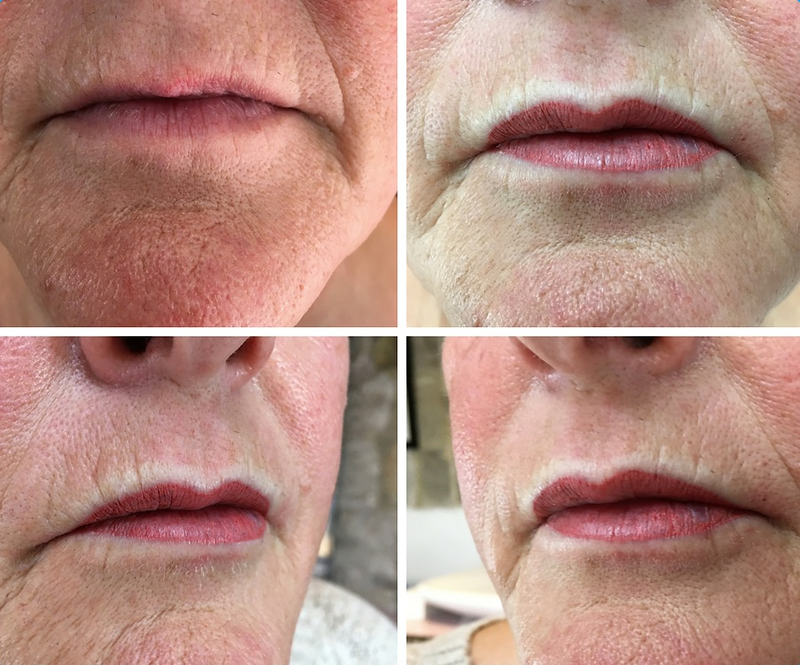 However, most of us lose definition as we age and just by redefining the lip line, even with a very natural lip colour your mouth will look amazing. We can also push that lip colour towards the centre of your mouth to mimic full lipstick. We have a huge range of pigments to choose from. Bring your favourite lipstick when you come and see us and we can colour match as far as possible. Following your initial consultation and agreeing the plan for your mouth, we apply numbing cream and allow this to settle in before beginning the procedure. Emma is gentle and works sensitively, no more than a little uncomfortable at worst! The heal with lips can be a little more challenging than eyeliner and eyebrows. As with all our procedures we ask you to “dry heal”, which basically means simply don’t touch them. Leave them to heal without any moisture or potions for as long as possible. We have trilled all sorts of healing aids and this is the very best way to get your lips to retain as much of the pigment as possible. However, your lips can begin to feel a little chapped and flaky after a few days, so we do allow (really) small quantities of healing aid. You return for a top-up procedure after 4 weeks of healing, which is when we implant another layer of pigment and can make any necessary changes to the healed colour. Click through our library to see examples of our work.